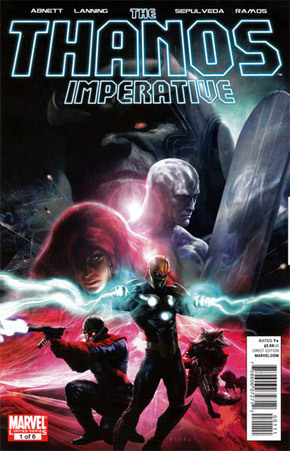 It’s probably safe to say that The Thanos Imperative is the biggest cosmic crossover Marvel has published since ‘Annihilation Conquest’ or perhaps the earlier ‘Annihilation War’ events, and the sales numbers for the first issue are there to prove this from what I’ve heard. Comic Impact Staff member Sheldon jumped onto this event, and enjoyed the first issue so much, that he made it his Pick Of The Week on one of our downloadable podcasts! But as many readers (longtime or new) will know, The Thanos Imperative does require some back reading. Sheldon asked me what issues he needed to pick up to learn about the build-up to current events, and now here I am giving you readers this article as a check-list for anyone who wishes to read up on the build-up as well. The Thanos Imperative the way I see it, is split up into three sections. Two big sections and one smaller section. The two big sections are the majority of the story, which focus around Nova and the Guardians of the Galaxy. The smaller section revolves around the Aliens from inside The Fault, which I will come to talk more about, as they crop up in various different series and places at different times. It is worth mentioning that The Fault, is something which has been around since the last issue of War Of Kings, but it is not by any means necessary to go back and read everything since then. The Fault is an easy concept to come to terms with and is constantly being re-explained throughout the series I’m about to mention. I’ll start with the first of the two big sections; Nova. Nova was put on hiatus to make way for The Thanos Imperative at #36, and is the easiest series to catch up on of them all, because strictly speaking you only need to read one issue prior to the events of Thanos Imperative to get to grips with his involvment in it. It deals with the imposter Quasar from the Cancerverse, and creatures from within The Fault native to the Cancerverse. The issues before #36 are not necessary reads. So Nova is very, very easy to read up on. 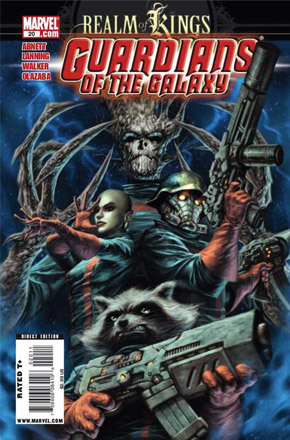 The second of the two big sections; Guardians of the Galaxy, is definitely a little harder to read up on, and it depends how deeply you wish to go into reading back on it to get an understanding of events. It is the series which actually deals with Thanos himself. Much like Nova, GotG was also put on hiatus, at #25. If you only wish to read the issues where Thanos is physically in the series, then you need only pick up #24 and #25. However, unlike in Nova where creatures from the Cancerverse (within The Fault) only show up in a single issue, they show up much earlier in GotG. In fact, there is a whole story-arc revolving around them before Thanos even gets a mention. If you want to get an even stronger understanding on the creatures from within the Cancerverse and enjoy an incredible story-arc, then pick up #20 through to #25. I do recommend reading from the 20th issue if you can afford it, it is worth it. Finally, onto the smaller third section of back-reading. This smaller section consists only of one issue. It is the ‘Realm of Kings: One Shot’ which came out in January earlier this year. In it we follow Quasar into The Fault and into the Cancerverse. 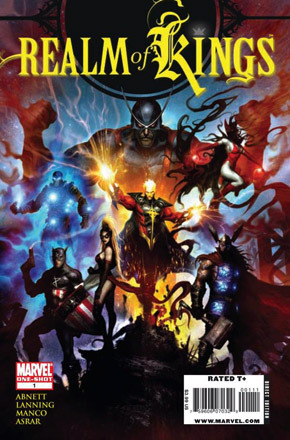 It is where we first see the Re-Avengers (who show up in The Thanos Imperative #1). It is not essential by any means, but it may be worthwhile to get an understanding of the threat which is the Cancerverse. Events in this one shot also get a brief mention in Nova #36 as well, so if you’re picking up that final issue of Nova, then this one shot might go nicely with that if you wish to get it. Here is a breakdown of the list, as I would see fit. Other than that, I don’t think there is anything else which you strictly would need to read to get into The Thanos Imperative. It is a complex story and does require this back-reading if you want to have any idea of what in kingdom come is going on. I hope this short, but worthwhile list was of help. Now, go forth and enjoy some cosmic goodness!